This art work seems like something my little girl would draw, but it is on auction for $1,125,000.00. It seems this season everyone is spending money like water, or at least the pop artist James Dillon Wright, also known as Dillon Boy hopes so. 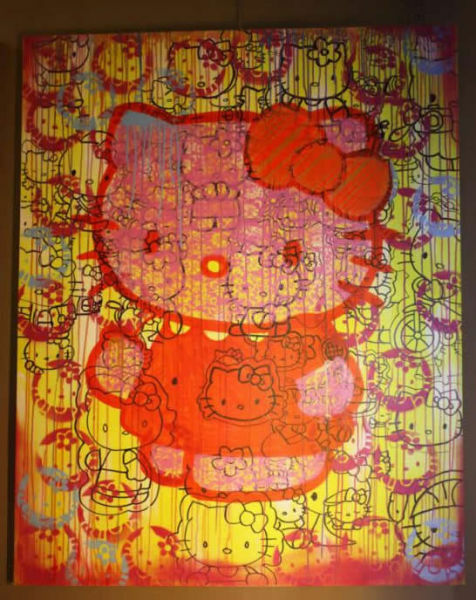 The artist states that this is the world’s largest Hello Kitty painting and measures in at four feet by five feet. The huge Miss Kitty painting is still for sale on e-bay with free shipping. Hurry over and bid fast. Learn Something Fun: Where does Hello Kitty live? She lives in London, England with her mom, dad, and twin sister Mimmy.